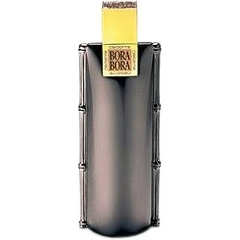 Bora Bora for Men (Cologne) is a perfume by Curve / Liz Claiborne for men and was released in 2002. The scent is synthetic-woody. The production was apparently discontinued. Ever since Bora Bora was released in 2002, that silly, dark, porcelain-looking bottle has always fascinated me. First thing I notice is that tart kiwi/ lime smell, which isn’t sweet. (I am fascinated with the smell of unsweetened fruit, for some reason.) After awhile, a fig and ginger drydown becomes apparent. I think this powdery (not baby powder, but spice powder) drydown is very original, and makes Bora Bora special. UPDATE: I don’t know if there has been a reformulation or not through the years, but I bought a bottle online and that fig and ginger drydown simply wasn’t there. So I don’t know if it was reformulated or watered down. But thankfully, I still have my vintage mini. Write the first Review for Bora Bora for Men (Cologne)!